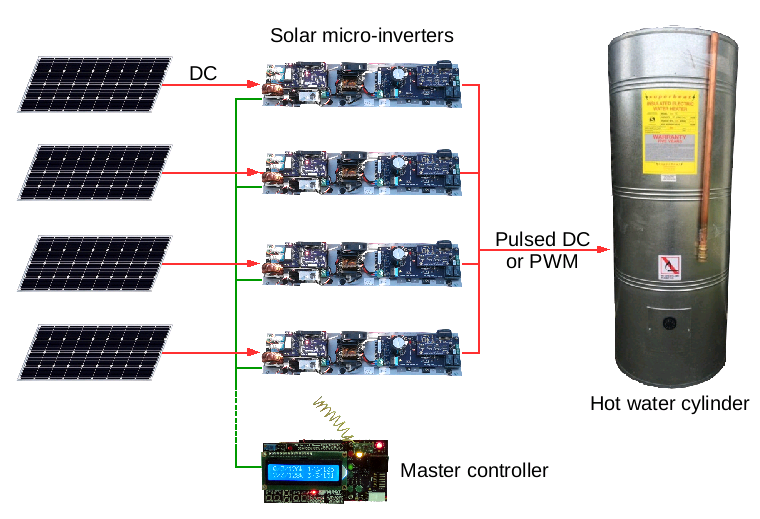 The micro-inverter works by taking the low voltage DC produced by a PV panel and creating a high voltage pulsed DC output. Outputs from multiple micro-inverters are combined together and used to drive the load, which in this case is the standard electric element of a hot water cylinder. The DC at the input to each inverter comes from a single panel (or perhaps pair of panels) and is considered low voltage. This offers improved safety when working on the DC side of the system. The output from the inverter is high voltage (~325V) pulsed DC and needs to be treated with similar care to a household AC circuit. Another way of thinking of the pulsed output is a PWM output with 100Hz frequency. The width of the pulse is varied according to the amount of power being generated by the PV panel. The pulse width never exceeds 50% thereby providing significant dead time during which the voltage is zero. It is this dead time that makes a pulsed DC system significantly safer than a DC system. Pulsed DC output is perfectly fine for driving a heating element. The present inverter design is capable of 400W output. The example above shows four such units running in parallel for a combined maximum output of 1.6kW. The timing of the pulsed DC output from each inverter is synchronised by a master controller unit located inside the dwelling. The synchronisation results in a steady 100Hz output and ensures dead time. The master controller contains an LCD display and keypad allowing the user to monitor the output from the system. Want to know more? Have a look at the gorey details. Feedback on the best way to start a public discussion would be much appreciated! Do you have have the need for a big 48V power supply? Check these out - supply 1, supply 2. To give away to a good home. Pick-up only, from Christchurch, New Zealand. Suit DIY electronics enthusiast. Drop me an E-Mail (see below for address).